Between 1405 and 1433 Chinese admiral Zheng He led seven expeditions across the Pacific and Indian Ocean as far as the west. His voyages led him over Indonesia, India and the Arabian coast to Africa, almost 100 years before Christopher Columbus. The Chinese fleet was so powerful, that the European ships would have looked like nutshells next to them. More than 300 “Dragon ships”, some of them up to 120 meters long, with their red sails made of silk showed the power of the Chinese emperor. Among other things, they brought the first giraffes and zebras from Africa to China. Every child in China knows the stories of Zheng He and they also entered the treasure of stories in the Arabic-speaking world, transforming his birth name “Ma Sanbao” to “Sinbad” (the sailor) - while he remained widely unknown in Europe. Karin Schäfer tells the story of the great Chinese explorer based on the viewpoint of some of the people who met him: in each of the countries he travelled to he left behind a story or an anecdote. Each of these tales is embodied by one figure representing also one of the main themes of his travels: a scholar from Arabia who exchanges scientific knowledge with the Chinese expedition; an African fisherman who helps bring wild animals, including a giraffe, onto the dragon ships; a businesswoman from Siam who knows the economic reasons behind the Chinese expedition. The Emperor’s historian, Ma Huan creates the narrative arc, delivering us these stories through his enigmatic Chinese characters. 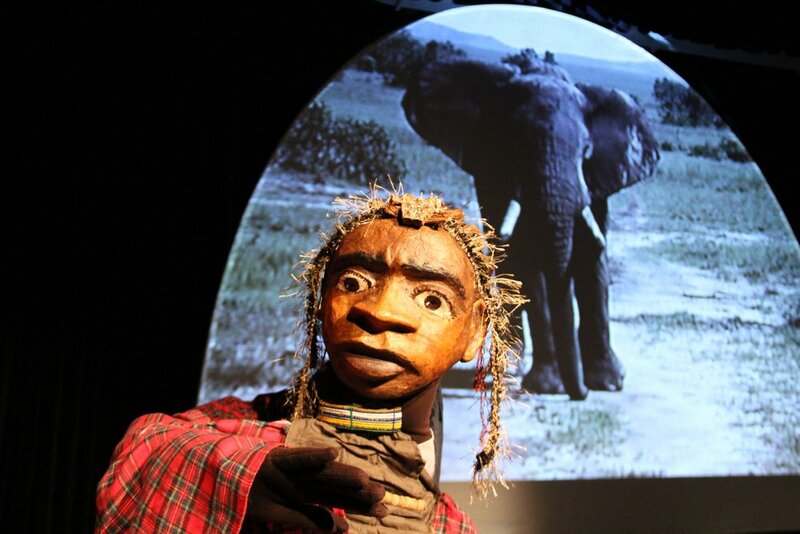 All of these different personalities - represented by life-sized mask figures accompany us with "strange words": every character speaks their own language, but they still manage to understand each other through imaginative ideas (and so does the audience). With multiple visual impressions we go through this fantastic adventure in a completely new form of combining puppet theatre, video, animation film and music. All videos and animated sequences in the play were also created by Karin Schäfer and Peter Hauptmann. 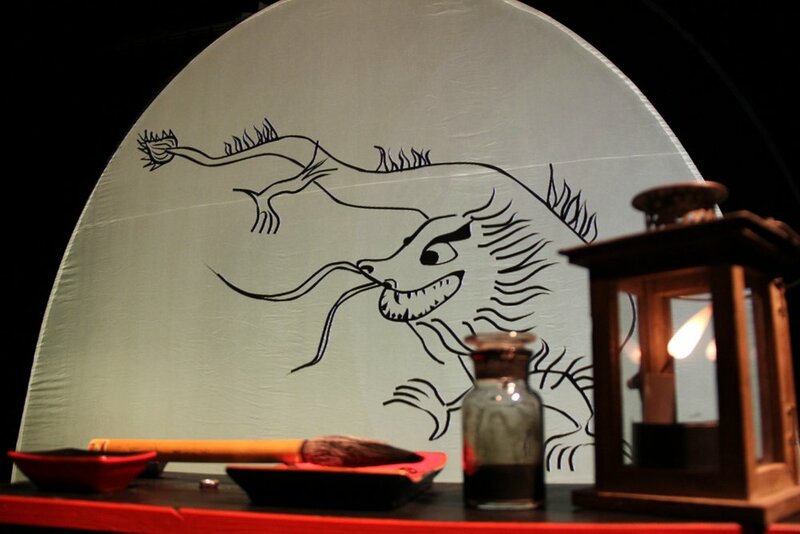 Many of the visual impressions in the projections come from their own travels with the productions of the Karin Schäfer Figuren Theater around the world. This closes the circle between their own experience and personal encounters and the travels of Zheng He, whose history they themselves have come to know on a trip to China. 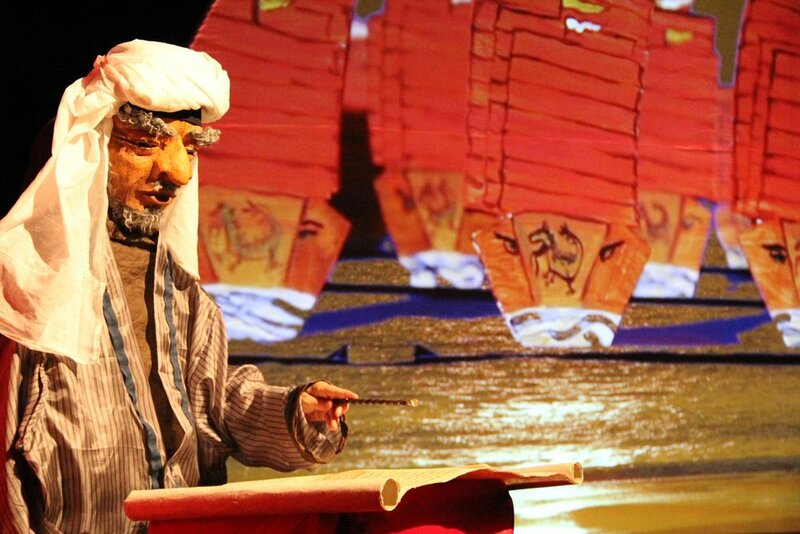 "A surprising feature of the stage setting is the interaction between the elaborate designed video and stage work: a character is painted on paper and magically transforms into a ship, video and actors perform dialogues and break the line between the screen and the stage, the animation films, film sequences, shadows and masks form a poetic space that continues the story on a visual level. The professional and multi-layered use of new media is phenomenal in this production. " Gernot Ebenlechner is the composer and responsible for the sound design. The traditional instruments and sounds from the diferent countries are fused and interpreted into modern sounds and rhythms, connecting directly to the younger audience. Austria, Germany, France, Spain, Portugal, Turkey, Serbia, Romania, Scotland, Northern Ireland, Croatia, Israel, Argentina, Chile, Brazil, Sri Lanka, Senegal and China. What is the reason you would like to see this video? Soon we will send you the link to a video recording of the complete work. We will also send you information about upcoming performances with this and other productions. Where can I see this play? We will protect your email address and never give it to others. Thank you for signing up for our newsletter! We are excited about your interest in Karin Schäfer Figuren Theater! Is the play on DVD? We do not use DVDs any more, but we do have a recording of a complete show online, if you wish to see this recording, we’ll be more than happy to send you the link to watch it. If you would like to broadcast or if you’re a journalist who would like to report about the play, then we’ll gladly send the link to those who are interested, as long as you promise to come to our next live-concert around your neighbourhood and that under no circumstances you share the link. How can one book the play? If you wish to book a play then please send an email to the following address: tour@figurentheater.at and we’ll get in touch with you as soon as possible. Would it be complicated, if we wanted to show this performance? Generally no, however a big and sufficient stage is necessary- min. 8m wide and 5m deep- light and sound system is required. We need 3 hours to build our stage set and to set up the stage lights which should be available (or rented) to use. We will bring the required video projections- you may download the technical rider here. How many members of the audience are allowed to come and at what is the age limit? The performance is suitable for children 7 years and upwards, it appeals to adults as well, we have evening performances for adults. The ideal seating would be between 100 to 400 seats maximum, it should be arranged according to the ascension of the seating areas, if the seating areas are completely flat then a maximum of 100 viewers are allowed to come. In what language is the show performed in? 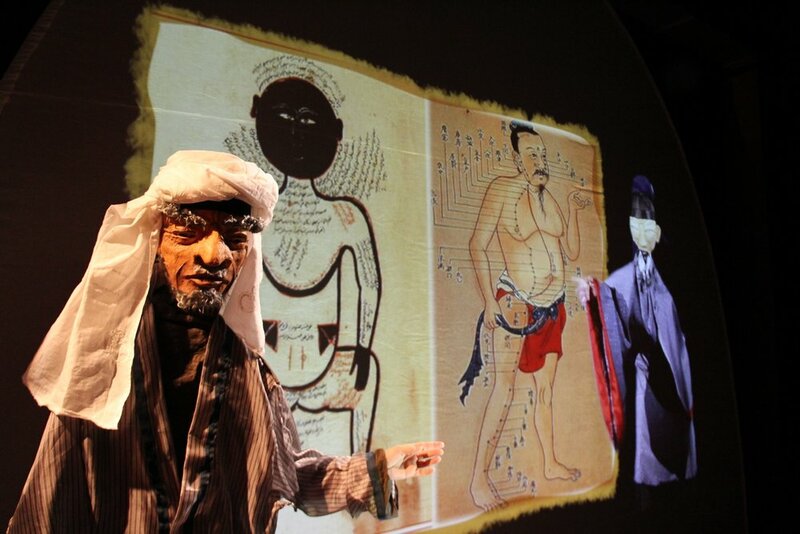 During the performance the characters speak their own language; Arabic, Swahili, Vietnamese and are just able to communicate with their guest, who can only speak Chinese. for the audience to understand the piece, Karin Schäfer narrates the story and she speaks either in German, English or Spanish (depending on the country) and if the narration should be spoken in any other language then an associate would be required on stage to translate the part of the story. Therefore, a rehearsal would be required. The narration only takes up a small part of the whole visual performance. We’ll happily send you a nonbinding overview of the fees- and travel costs if you let us know when, where and in what setting you would like to show our play. Several performances at the same location is a lot more cost-effective than a single performance. For this performance we are a team of 2 to 3 people: 1 performer, 1 light technician and 1 manager, who is also responsible for the projections on stage and in some cases also takes over the lighting on stage. Do you have a lot of luggage? The stage design and props are dismountable and transportable and we carry them in 2 metal boxes (90 x 50 x 40cm) - we can bring them on airplane as well. Who participated in this piece? You’ll see a line-up of the production team with whom we usually travel below on this page. Please write to us at the following address: info@figurentheater.at - we will gladly answer any further questions you may have, we look forward to your message!